Whitby’s recent run of late winning goals continued as Richard Pell buried his old club just six days before their FA Cup third round date with Birmingham City. The defender, who played for Harry Dunn’s Blyth against Blackburn Rovers, at the same stage, in 2010, struck his second goal in as many games, a minute from time. Blues boss Darren Williams was down to the bare bones, with another centre-half Kev Burgess again missing with a sickness bug, a third, Ibby Hassan was missing after being admitted to hospital with breathing difficulties the night before and a fourth option, Jamie Poole, was ruled out with a neck injury. Long-term casualty in that position, Lee Bullock, is set to return late in January from his knee ligament injury, while midfielder Lee Mason’s problem groin kept him from facing his former team-mates. Skipper Mark Robinson again played through a groin strain of his own and fellow full-back Liam Shepherd was rushed back from the flu that kept him out of Boxing Day’s draw at Frickley. Summer signing Anthony Callaghan made his first-ever start for the Seasiders, in an unfamiliar role alongside Pell, while striker Zak Boagey was in a Town squad for the first time this season. Alongside him on the bench, was another forward, local lad Sam Calvert, who hadn’t kicked a ball for Whitby since September. Town started strongly in a typically cagey match, as Matty Brown fired into the side netting on 13 minutes and moments later, Blyth keeper Peter Jeffries was stranded after heading straight to Niall Doran, Town’s third change from Friday’s trip. The ex-Hull City midfielder, with his low centre of gravity, shot first-time from 25 yards, but picked out Nathan Buddle, who blocked in the six yard box. The visitors registered their first shot in the 21st minute as Dan Maguire rattled the outside of Shane Bland’s left-hand post, with a 20-yard effort out of nothing. Their confidence grew and Shepherd slid in to block as Ryan Hutchinson, up from the back, drove in a low shot, after collecting Matthew Wade’s backheel. Alex Nicholson then exchanged passes superbly with Wade down the right, before powering a rising, angled effort just over the Blues’ bar. A bright spell for the hosts, early in the second half, culminated in former Middlesbrough frontman Matty Waters forcing Jeffries to push wide, low to his left. At the other end, a right-wing cross was nodded across the face of goal by Spartans’ talismanic skipper and beanpole winger Robbie Dale. The elusive Dale, with his excellent footwork, then threatened again, cutting in off the left and hooking towards the roof of the net, only for Bland to tip over expertly. The corner brought another fine Bland save, this time low to his left, from Wade. The best stop of the lot came on 81 minutes as Jarrett Rivers, the star of Blyth’s Second Round win at Hartlepool United, raced onto a perfect Dale through-ball only for Bland to parry brilliantly one-on-one, again low to his left. As the match opened up, it was then Town’s turn to threaten, five minutes from time. The outstanding Doran turned well inside the Blyth box and fired a stinging low drive straight at Jeffries, who fell forward to claim. Then with a minute remaining, roared on by a bumper 584 crowd – the biggest of the season at the Turnbull Ground – Whitby won a free-kick by the right touchline, level with the edge of the penalty area. There, watched by the Sky cameras following the away side and just seconds after Boagey came on for Doran in an attacking change, Williams left just two defenders on halfway to deal with two forwards. Pell was waved forward and Dale Hopson found him instinctively at the near post and the powerhouse stooped to nod past a helpless Jeffries. The Turnbull Ground erupted, and after five agonising minutes of injury time, the Blues had their third win in four meetings over the cup giant-killers. Local businesses and individuals, including home kit sponsor The Hart Inn of Sandsend and the owners of the Victoria Hotel in Robin Hood’s Bay, had pledged to pay the club money per additional fan over the 300 attendance mark. Thanks to the terrific numbers – over 200 more than the same clash last Boxing Day – these donations will add up to over £4,000 for Whitby Town FC. There was further cause to celebrate as nine members of the FA Vase and Northern League winning side of 1996-97 were presented to the busy crowd at half-time. Led by skipper Neil Hodgson – who also led the famous chant of Sea-Sea-Seasiders – Allan Martin, Michael Williams, Andy Toman, Graeme Williams, Kenny Goodrick, Mitch Cook, Jimmy Scott and Ian Williams took their place in front of the main stand to warm applause. The current chief, Darren Williams, wanted to applaud the supporters who attended and his players for their efforts. 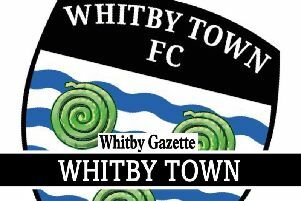 “The lads were fantastic,” he told the Whitby Gazette. “Despite a reshuffled squad, system and personnel, they rolled up their sleeves and earned the right to win the game.